Status: Rare casual winter visitor statewide. Documentation: Photograph: 5 Feb 1982 Ames, Dodge Co (Bray et al 1986). Taxonomy: Two subspecies are generally recognized (Pyle 1997, Gill and Donsker 2017, Clements et al 2016, Knox and Lowther 2000), exilipes, breeding in the tundra of northern Eurasia and northern North America, and hornemanni, breeding Ellesmere Island, Baffin Island, and northern Greenland; wintering to northern USA and British Isles (Clements et al 2016). There is no evidence regarding subspecies occurrence in Nebraska. A recent proposal to AOU to lump the redpolls, including Common and Hoary Redpolls has not yet been voted upon (AOU 2016). Reports of Hoary Redpolls may merely represent the palest redpolls in a continuum of a single species; there is little or no genetic structure among redpolls (see Comments). Winter: There are 11 reports of this species for Nebraska. There are no records accepted by NOURC, although only three, all in Jan-Mar 2013, have been submitted. Nevertheless, Hoary Redpoll was added to the state list based on a record (cited above) accepted by Bray et al (1986) prior to the inception of NOURC in 1986. There were four additional records before 1986, three accepted by Bray et al (1986); these were in 1970, 1972, and 1978 (Douglas Co). There were only two more reports between 1986 (Bray et al 1986) and the 2013 reports; one in 1996 was acceptably documented (see Comments). 27 Feb-15 Mar 1972 Offutt Base Lake, Sarpy Co. “The Hoary Redpoll was found at Offutt Base Lake by Terry Maxwell and was observed over a period of days by others. It was very white, with a white rump and a distinct lack of streaking on the sides. 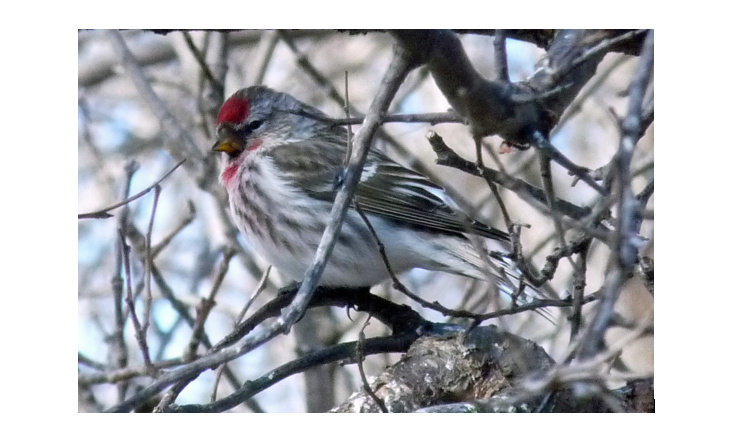 It could be picked out of the flock of Common Redpolls easily without binoculars” (Cortelyou 1972). “A hoary Redpoll was studied carefully at Bellevue, Nebr. daily from Feb. 28 – Mar 15 (TM, mob).” (Williams 1972). 13-17 Feb 1978 Douglas Co (Bray et al 1986 written description in possession of authors; Williams 1978). 5 Feb 1982 Ames (Manning 1982; Bray et al 1986: “This photo is considered diagnostic as it shows an immaculate rump and a rather short bill”. 18 Mar 2013 photograph Burwell, Garfield Co; this record was not accepted by NOURC (Brogie 2014). The only other reports are of one in Gering, Scotts Bluff Co on the extraordinary date 20 May 1968, described as having an “unstreaked white rump,” and not with any other redpolls (Young 1968), and one reported without details 25-26 Feb 1978 by Daryl Giblin in Lancaster Co (Williams 1978; Cortelyou 1978). One was “apparently observed” in Dixon Co 29 Jan-29 Feb 1996 (Grzybowski 1996). Nebraska is at the southern limit of occurrence of Hoary Redpoll, although Iowa has a surprising 29 records, all in the period 16 Dec-21 Mar (Iowa Birds and Birding, accessed April 2018). There are none for Kansas (Thompson et al 2011), and Colorado’s six records were all in winter 2012-2013 (CBRC). Hoary Redpoll is rare in South Dakota, mostly in the northeast (Tallman et al 2001), and in Wyoming there are 11 reports (Faulkner 2010). Notwithstanding, there is a proposal submitted to AOU (2016) to lump the redpolls as a single species, but as of April 2018 a vote has not yet been taken. Photograph (top) of a possible Hoary Redpoll at Burwell, Garfield Co 18 Mar 2013 by Bob Gerten; this record was not accepted by NOURC (Brogie 2014; see Comments). American Ornithologists’ Union [AOU]. 2016. AOU Classification Committee – North and Middle America Proposal Set 2016-A 10 Nov 2015. Bray, T.E., B.K. Padelford, and W.R. Silcock. 1986. The birds of Nebraska: A critically evaluated list. Published by the authors, Bellevue, Nebraska, USA. Brogie, M.A. 2014. 2013 (25th) Report of the NOU Records Committee. NBR 82: 131-146. Cortelyou, R.G. 1970. 1970 (Forty-fifth) Spring Migration and Occurrence Report. NBR 38: 74-87. Cortelyou, R.G. 1972. 1972 (Forty-seventh) Spring Migration and Occurrence Report. NBR 40: 72-86. Cortelyou, R.G. 1978. 1978 (Fifty-third) Spring migration and Occurrence Report. NBR 46: 66-85. Faulkner, D.W. 2010. Birds of Wyoming. Roberts and Company, Greenwood Village, Colorado. Grzybowski, J.A. 1996. Southern Great Plains Region. Field Notes 50: 296-300. Knox, A. G. and P. E. Lowther. 2000. Hoary Redpoll (Acanthis hornemanni), version 2.0. In The Birds of North America (A. F. Poole and F. B. Gill, Editors). Cornell Lab of Ornithology, Ithaca, New York, USA. https://doi.org/10.2173/bna.544. Manning, R. 1982. A Hoary Redpoll in Dodge County. NBR 50: 37. Sibley, D. 2008. A Character Index for Redpoll identification (blog post). The Sibley Guides (blog), accessed 19 Jun 2018. Tallman, D.A., Swanson, D.L., and J.S. Palmer. 2002. Birds of South Dakota. Midstates/Quality Quick Print, Aberdeen, South Dakota, USA. Williams, F. 1972. Southern Great Plains Region. American Birds 26: 624-626. Williams, F. 1978. Southern Great Plains Region. American Birds 32: 223-227. Young, S.R. 1968. Hoary Redpoll. NBR 36: 77-78.